As advances in nanotechnology bring us increasingly energy efficient products, plant life such as algae could become attractive sources for tapping energy. The Latro lamp by designer Mike Thompson is a speculative product responding to this potential future market. 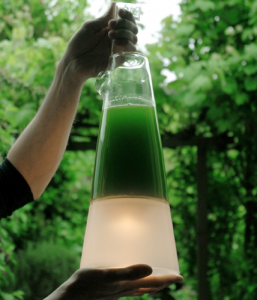 It utilizes living algae as its power source. The idea was inspired by a scientific breakthrough by scientists from Yansei and Stanford University that allows a small electrical current to be drawn from algae during photosynthesis. Placing the lamp outside in the daylight, the algae use sunlight to synthesize foods from CO2 and water. The energy produced is stored in a battery ready to be called upon at night. 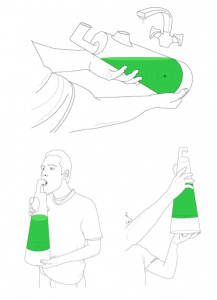 Owners of Latro are required to treat the algae like a pet – feeding and caring for the algae rewarding them with light. A light sensor monitors the light intensity, only permitting the leeching of electrons when the lux level passes the threshold – avoiding algae malnourishment.